Occasionally you see an idea executed so perfectly that it's almost shocking how easy it looks. It's usually by some high-end advertising agency with a budget of millions. No photoshop was used, no design degree and no hint of irony. The initial feeling of surprise and admiration is quickly followed by the voice in my head saying… "Why couldn't I think of that", followed by a few minutes of deep depression. It's always a reminder, the more simple the execution the bigger the impact. A bit like the Saatchi advert picturing a man with a cushion pushed up his jumper. Without the caption it's fairly unremarkable. The caption just takes somewhere completely different. 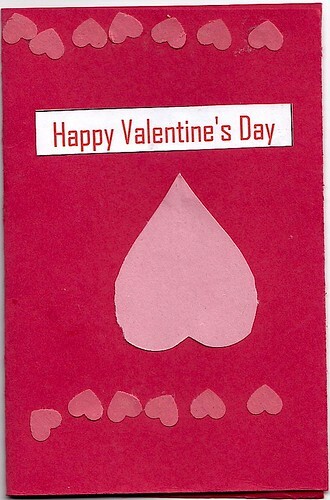 I didn't create this ironic, iconic valentines card. I didn't sweat over a brief into the small hours. No photoshop was used, no design degree and no hint of irony. It's not a satirical look at how love has become commercialised. My 5 year old came home and handed me this and gave me a big kiss. She made it with card, prit and scissors. I looked at the card, laughed out loud and then thought to myself, "Why couldn't I think of that", that was 2 hours ago and I'm still depressed.